Once again, the summer had passed and it was time for the Flags on the 48. I had chosen Mt. Hale this year because most of the four who planned to go with me hadn't been very active lately and Hale is one of the shorter 4,000 footers. As September began, people started canceling from the hike, and before long my crew was down to just me and one other person: Paul (Paul actually invited a friend of his, Rich, who joined us as well). The ironic thing, of course, was that none of the inactive guys that I considered when choosing a peak actually came with me; this turned out to be a good thing, however. We knew that Zealand Road was going to be closed for bridge repairs, but also that there was a shuttle that could take us to the trailhead. Upon arriving at Zealand Road we talked with the Zealand Camp caretaker, who erroneously told us that the shuttle only took people from parking lot to parking lot along route 302, so we accepted this and started the 3.2 mile walk to the trailhead. Although the walk to the trailhead more than doubled the length of our hike, the road was easy to walk on and we made excellent time. Of course, halfway to the trail, we passed the AMC van that could have given us a ride, but the timing was poor (they were heading in the other direction) so we pressed on. Although we were now later than we had planned, we managed to reach the Hale Brook trail by 11:30 AM and began our climb. 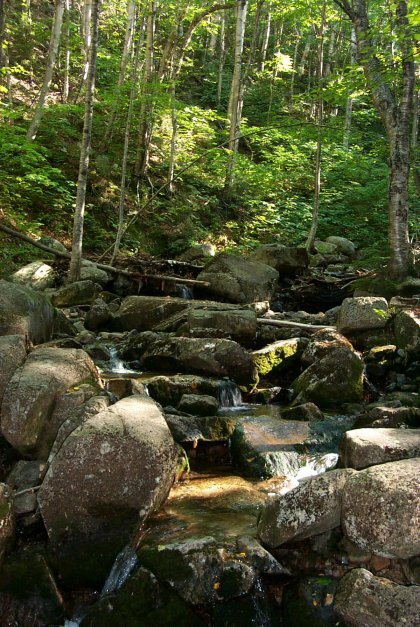 The Hale Brook trail starts with a moderate grade and decent footing in typical one-hiker width. Our 3.2 mile walk to the trail had me a bit tired, but Paul and Rich were in fine shape. The grade is steady and fairly consistent, and takes a toll on your legs if you are moving at a fast pace, which we were. Before long, the consistently moderate grade and pace had my legs burning, so I asked Paul and Rich to keep going while I slowed down. They were more than happy to oblige and continued on their way. 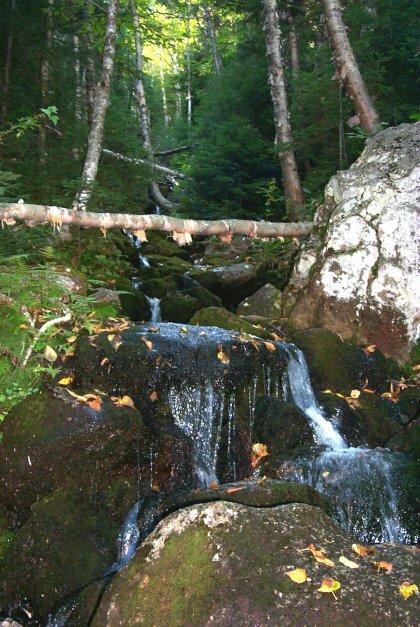 At about one mile, the trail crosses the Hale Brook, which is a good place for water. Crossing was simple and would probably not be difficult even during the spring thaw or following a heavy rain. As I pressed on, the trail remained steady and moderate, and I took fairly frequent breaks to allow my legs and lungs to catch up. About another � mile up, the trail crosses the Hale Brook again (although the map doesn't really show this) and the terrain becomes slightly steeper. Just beyond this second crossing, the trail has four switchbacks to deal with the steeper grade, and thus manages to maintain that moderate grade I'd by now gotten used to. After the fourth switchback, the grade lessens and some occluded views are available (although none worthy of photos). The trail narrows and ascends to the summit steadily with few flat areas for walking breaks. 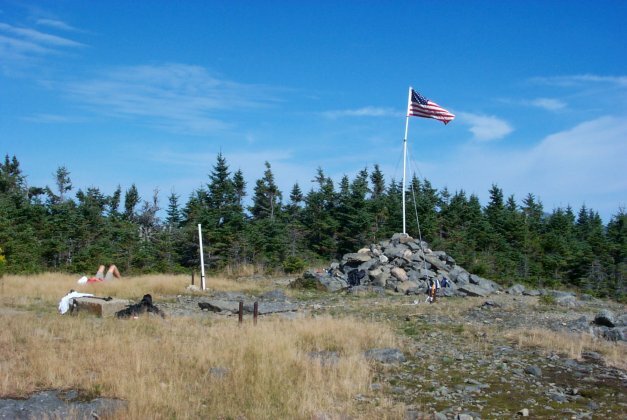 As I approached the summit, I could hear Paul and Rich, and when I broke out into the clearing I could see that they already had managed to get the flag up and secured. I was dying to know what time it was, and I was amazed to find out that it was only 1:05 PM. The AMC guide tells us this hike should take 2 hours and 15 minutes - Paul had completed it in 1 hour and 10 minutes, Rich had done it in 1 hour and 25 minutes, and I had done it in 1 hour and 35 minutes. I guess we were motivated! As we looked around, we easily saw the flags posted on North and South Twin, Mt. Tom, Mt. Washington, and Mt. Adams. We relaxed for a while and talked about the terrorist attacks while at the same time being exceptionally happy to be at the summit of a NH peak on probably the most beautiful day of the year. I mentioned that I love doing this hike because it's an excellent way to honor the firefighters, police, and other emergency crew who gave their lives while trying to rescue others. Rich mentioned that he also feels like it's a great way to give the proverbial finger to the terrorists and show them that they can't break a great country like ours. Paul and I had to agree. 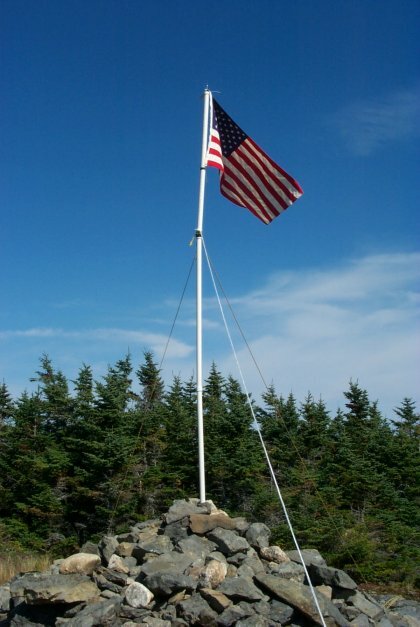 By 2:30, we thought we should break down the flag pole and be on our way. We packed up and hit the trail at about 2:50. The trail back down was just the same as it was on the way up, and we made excellent time on the return trip. By 3:25 we were back at the trailhead, looking for the AMC van to cart us back to route 302, but it never came. The walk back down was uneventful and not terribly interesting. By 4:10 we were back at the truck, preparing to head out, wondering how the heck we had made such great time. I like to think I was motivated by the event, and just happy that I could spend a gorgeous summer day hiking to honor some very brave, selfless people.